Living Paycheck - to - Paycheck? Sign Up Today! ¿Vives de Cheque a Cheque? ¡Inscríbase hoy! The Northwest Bronx Resource Center is a collaborative effort with six established nonprofits to provide a range of free financial and affordable housing services. All services are offered in the Refuge House, located at 2715 Bainbridge Avenue off of East 196th Street. The NWBRC is an NYC Financial Empowerment site and UNHP is an HPD Housing Ambassador. No Walk-ins. All services are provided by trained professionals and by appointment only. The UNHP Free Tax Preparation Program is supervised by trained professionals and taxes are prepared by IRS trained volunteers. Tax appointments can be made starting in January each year. All services are free. Click here for a list of upcoming events, including financial education workshops. 1-on-1 Financial Coaching is just one of the services offered at the Northwest Bronx Resource Center. UNHP has long been active in preserving and creating affordable housing in the neighborhood and providing assistance to local residents. This year working with our partners, we helped over 1,400 low-income Bronx residents file their taxes for free and access other free financial and affordable housing. Ariva is a leader in free tax preparation services in New York City, and works to empower low-wealth New Yorkers with effective tools and resources so they can make informed financial choices and achieve economic stability. Legal Aid Society works with UNHP by providing a trained legal expert at our office once a month who can work with homeowners and assist them to address their mortgage, lien and foreclosure issues, and remain in their homes. Assistance with STAR program enrollment is also available to senior and low-income homeowners to reduce property taxes. In partnership with Neighborhood Trust Financial Partners, the UNHP Northwest Bronx Resource Center became an NYC Financial Empowerment Center in 2017. The Center offers free 1:1 financial counseling 3 days a week by appointment. UNHP is also working the Neighborhood Trust Financial Partners, an established financial education non-profit with a full-service credit union arm, to provide group financial workshops that consist of a five-class series alternating in English and Spanish. Part of the Solution (POTS) started out as a soup kitchen and now offers a “single stop” to people in need, offering a wide range of assistance from meals to social services. POTS provides SNAP and healthcare insurance services to UNHP via a TEN tracker system. UNHP refers clients through this system and POTS follows up with an appointment. POTS is walking distance from the Northwest Bronx Resource Center and has been a community partner with UNHP for many years. NYC Tenant Support Unit, is the Center’s newest partner. Created by Mayor DiBlasio to provide assistance to tenants at risk of harassment or displacement, the Unit provides assistance and referrals to tenants facing eviction, landlord harassment, poor housing conditions and seeking affordable housing. In addition to legal referrals, TSU helps tenants by connecting them to other vital City services, such as HomeBase and HRA Job Centers. “Community work is a team effort.” -Jim Buckley, UNHP Executive Director. 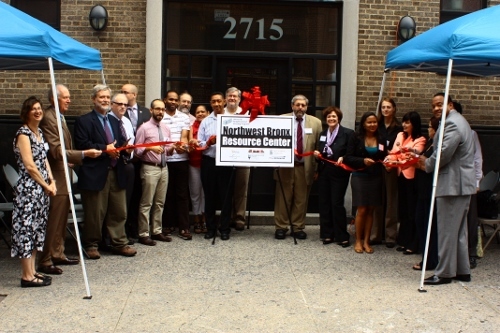 UNHP launched the Northwest Bronx Resource Center at a ribbon cutting ceremony in July 2012, and has since then served over 13,000 clients. The Center provides a range of financial and affordable housing services from six experienced non-profits at one Northwest Bronx location. Sign up today for free tax preparation, homeowner assistance,eviction prevention, NYC Housing Connect and Rent Freeze enrollment.